Large animals, called megafauna, went extinct in Madagascar about 1,000 years ago. Humans are believed to have played a major role in their disappearance. A human population boom, supported by the shift from a hunter-gatherer to a pastoralist-herder lifestyle, was a key driver, a new study says. Large populations meant more hunting pressure and habitat degradation, ultimately leading to extinction. Until about 1,000 years ago, Madagascar was home to fantastical creatures like elephant birds, giant fossas and large-bodied lemurs. Unlike their present-day cousins, they were enormous — bigger than the average human. Then, in a span of a few hundred years (between A.D. 700 and 1000), these large animals, called megafauna, vanished. Scientists have puzzled over what caused this extinction and the role, if any, humans played in it. Now, new research suggests that humans did play a key role but in a way unexplored by current theories. Madagascar, sometimes referred to as the eighth continent, is the world’s fourth-largest island. It’s also the oldest, formed about 86 million years ago when a chunk of landmass twice the size of Arizona broke off from the Indian subcontinent. Over millions of years, it supported the development of an array of unique plant and animal species not found anywhere else in the world. 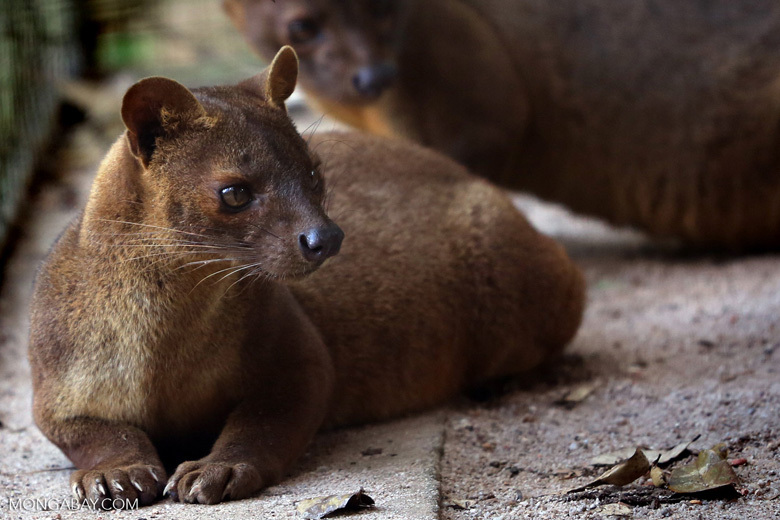 Present day fossa species are much smaller in size than the giant fossas that roamed Madagascar about 1,000 years ago. Image by Rhett A. Butler. Humans appeared on the scene much later. The timing is still debated, but new evidence points to a human presence in Madagascar about 10,000 years ago. The advent of people spelled doom for the large animals, but how their interactions played out is still being investigated. “The key to understanding extinction (according to our hypothesis) is not whether or not people were present or even whether or not people were hunting big wild animals, but what else were they doing?” Laurie Godfrey, a paleontologist at the University of Massachusetts Amherst and co-author of a new paper in the Journal of Human Evolution, told Mongabay by email. The pivotal factor, the authors argue, is population size. They mustered evidence showing that the drastic decline in Madagascar’s megafauna coincides with a dramatic increase in the island’s human population. Their research aimed to answer the following questions: When did the animals die off? What were the humans doing at this time? What were the climatic conditions? To do this, the researchers conducted radiocarbon dating for living and extinct species at the same sites and studied animal bones at these sites for signs of butchery inflicted by human tools. They also examined speleothems, spiky mineral deposits created by water dripping from cave ceilings. Chemical signals preserved in these formations record changes in rainfall patterns and even vegetation. The scientists also relied on human genetic data for clues about the arrival of humans and also population sizes. 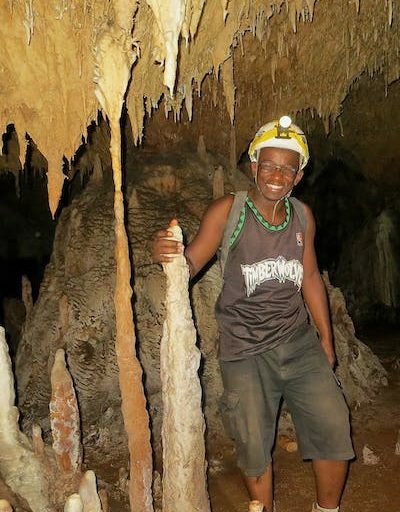 Graduate student and research team member Peterson Faina with stalactites and stalagmites (a kind of speleothem) in a cave in Madagascar. Image courtesy of Laurie Godfrey. Together, the evidence suggests that the human population boom was made possible by a shift in the mode of subsistence from hunting and gathering to herding and farming. An influx of migrants from Indonesia around this time also fueled the population rise. However, these new agriculturalists did not limit themselves to growing their food and domesticating animals; they continued to hunt to supplement their food supply. The growing population meant their hunting became extensive enough to drive the giant animals to extinction, the new paper concludes. The surprising implication is that raising domesticated animals may have led to greater, not lesser, hunting pressure on wild animals. 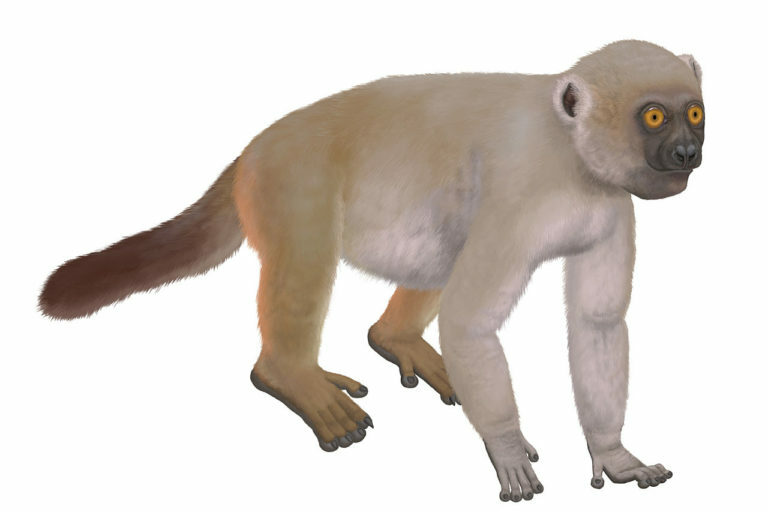 A life restoration of Hadropithecus stenognathus, an extinct species of lemur, based on fossil evidence. H. stenognathus is thought to have weighed between 27 and 35 kilograms (60 and 77 pounds), more than three times the size of the largest living species of lemur, the indri (Indri indri). Image by Smokeybjb via Wikimedia Commons (CC BY-SA 3.0). However, while the researchers believe hunting may have triggered the mass extinction, they do not believe it was the sole contributor. Habitat destruction caused by the new way of life intensified the decline in wild animal populations. The researchers also argue against a prevailing theory that widespread drought caused the extinction. “We document evidence that the rapid decline in the populations of big animals on Madagascar did not coincide with a change in climate. There was no drought that killed the big animals!” Godfrey said. This new understanding has implications for present-day conservation efforts, notably that humans coexisted with large animals for thousands of years without precipitating a devastating crash. “This means that megafaunal extinction is not an inevitable consequence of human presence, which in turn suggests that people can engage in activities that do not result in extinction,” Godfrey said. 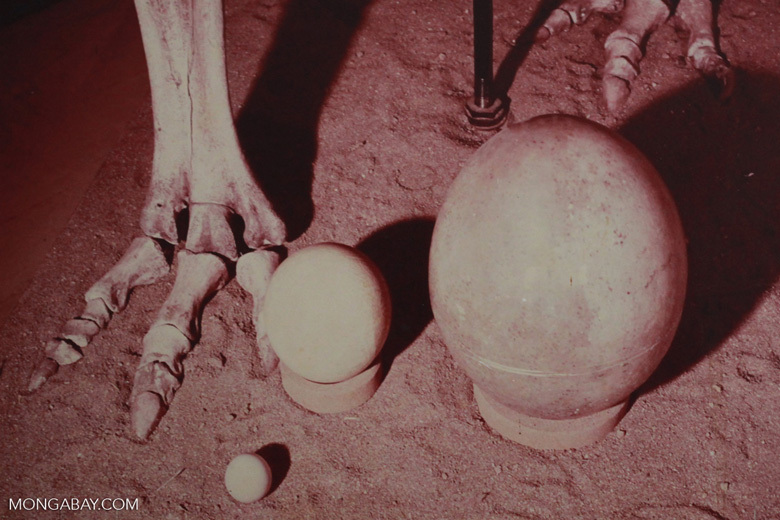 Size comparison between the eggs of an elephant bird, ostrich, and chicken. Image by Rhett A. Butler. 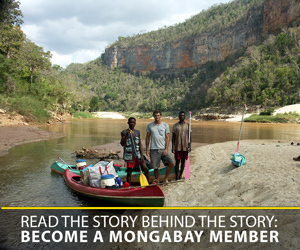 Malavika Vyawahare is an environmental journalist and Mongabay staff reporter for Madagascar. Godfrey, L. R., Scroxton, N., Crowley, B. E., Burns, S. J., Sutherland, M. R., Pérez, V. R., … & Ranivoharimanana, L. (2019). A new interpretation of Madagascar’s megafaunal decline: The “Subsistence Shift Hypothesis.” Journal of Human Evolution, 130, 126-140. FEEDBACK: Use this form to send a message to the editor of this post. If you want to post a public comment, you can do that at the bottom of the page.